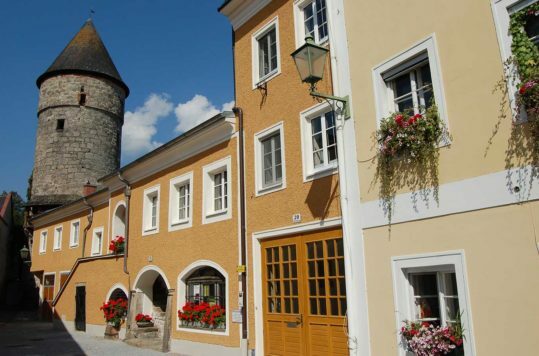 There are hundreds of mediaeval castles in Austria. Many of them well preserved and at fantastic locations. 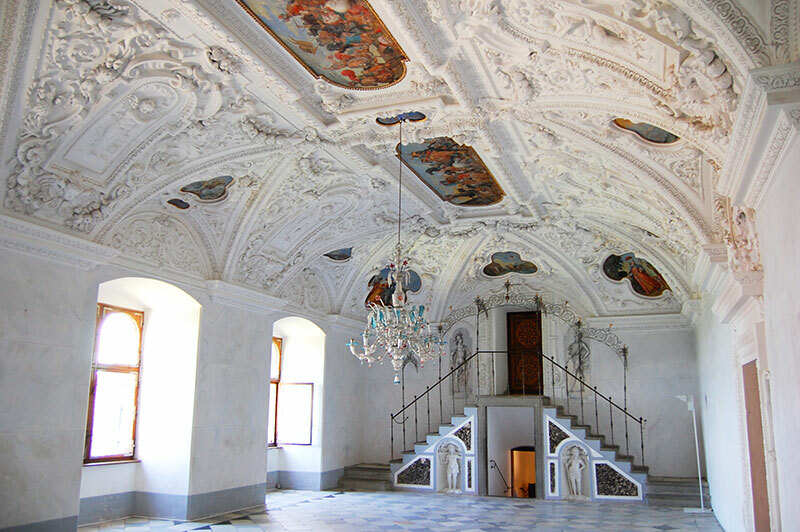 Riegersburg castle in south-eastern Styria is impressive, inside and outside. 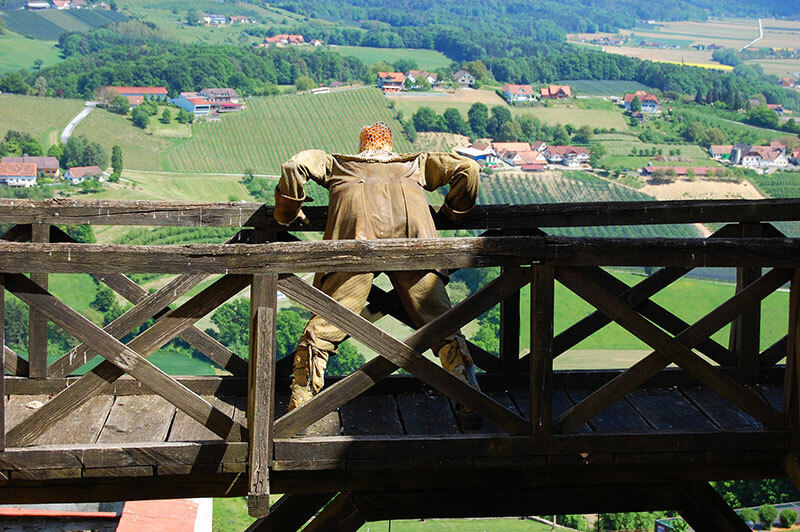 From whatever direction you arrive, the Riegersburg Castle firmly stands out sitting on top of a volcanic peak 480 metres above sea-level. Don’t worry the volcano has been extinct a couple of million years. If you love castles and the Middle Age this one is a must visit. 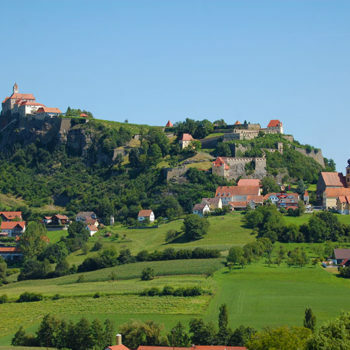 The knights of the 11-century knew how to pick the location for their castles, and Rudiger von Hohenberg built an impressive castle, firmly standing out in the hill-country in south eastern Styria. Probably not only for the great views of their lands, but more so for defence. 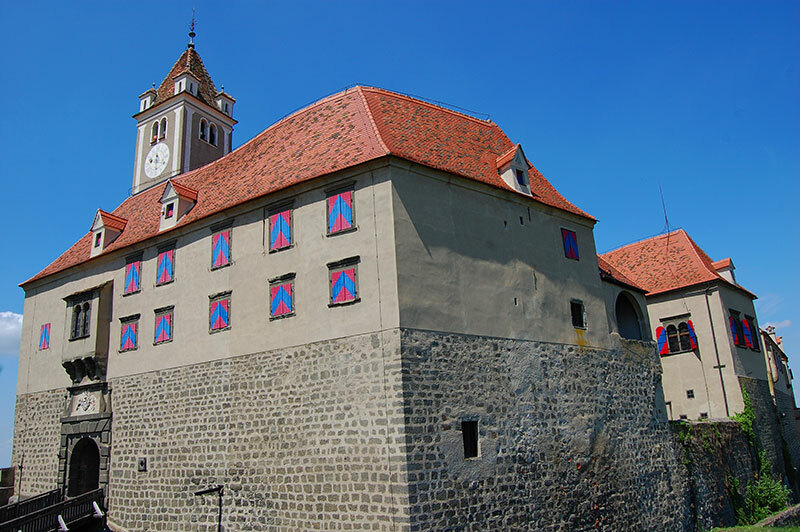 In this part of the Habsburg Empire, the late Middle Ages were an almost continuous period of armed conflicts with local feuds or war between the Bavarians, which inhabited the area and the neighbouring Hungarians. 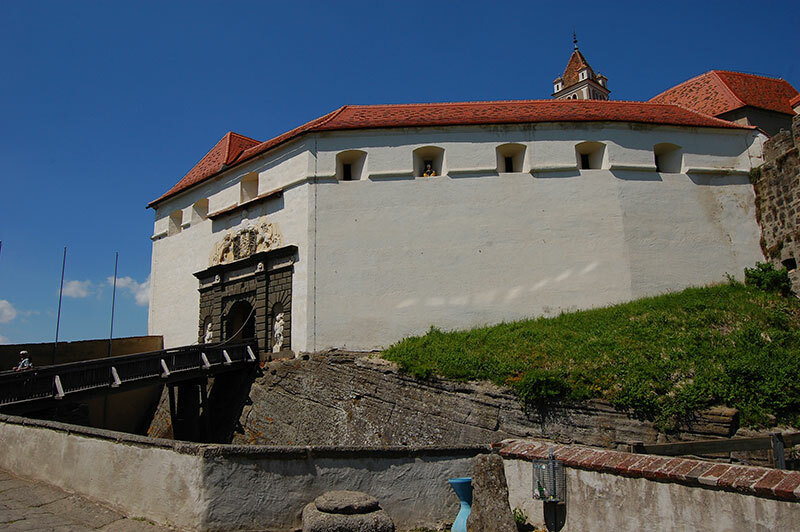 Thus, the castle was extended over the centuries to the impressive stronghold you see today. 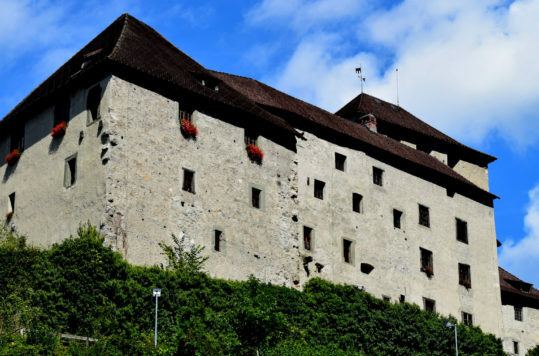 Today Riegersburg Castle is owned by the Princely Family of the microstate Principality Liechtenstein, who bought it in 1822. Arriving at the first gate across the draw-bridge you can see the deep traces of history. The cart tracks which have digged deep grooves into the basalt rock over the centuries. Astonishingly, the castle builders digged out a second moat in the volcanic rock to make it even harder for any attackers. You can get up on the ramparts of the outer walls. Between the inner and outer walls you can also see a blacksmith’s workshop, where you during special venues can watch real blacksmiths at work. 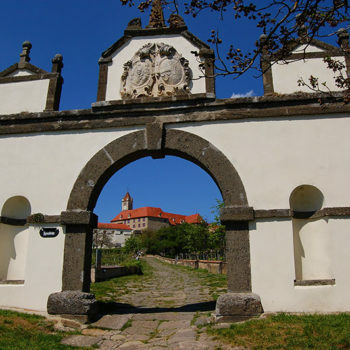 For visitors, the second gate also means that you must pay to go further. Nonetheless, the € 12,50 entrance fee is worthwhile as it also give you entry to the museums. 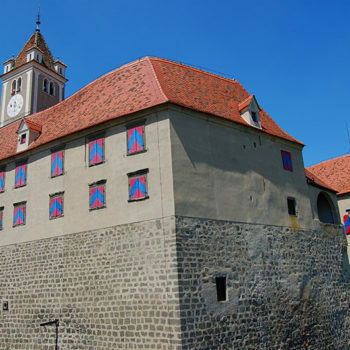 The castle houses a Witches Museum and a Weapons Museum, in addition to a series of rooms that are open to the public. 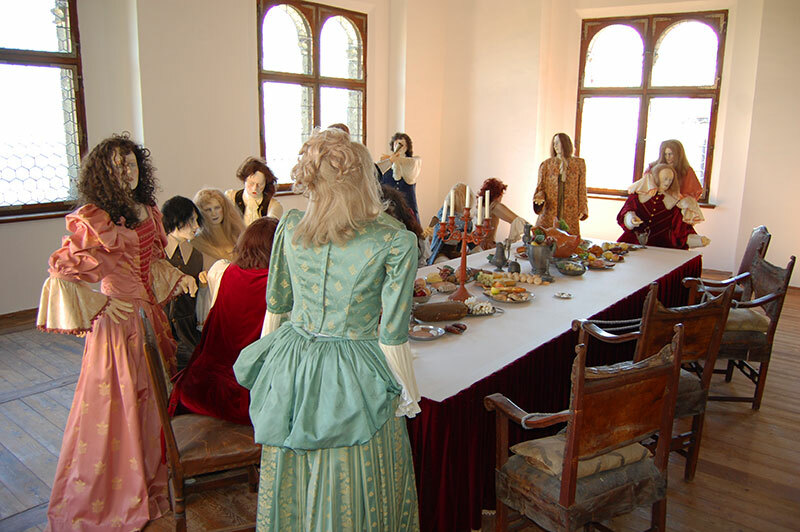 The Witches Museum tells the true horrific stories about the witches who were brought before the court by the Duchy of Styria between 1673 – 1675. The Weapons Museum has a substantial collection of arms from the Middle Ages up to the 17th century. Not only for warfare, but also for hunting and performing purposes. You can also get hands-on with the historical weaponry, as a few items such as a sword, knights helmet and a gun can be held by the visitors. Relax, they are of course not useable and are chained or wired in place. 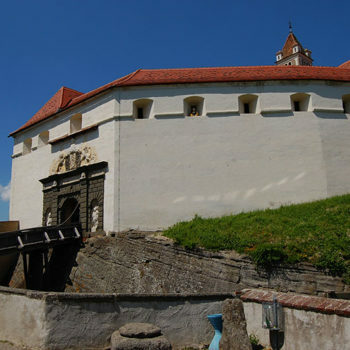 25 of the castle’s 108 rooms are open to visitors. 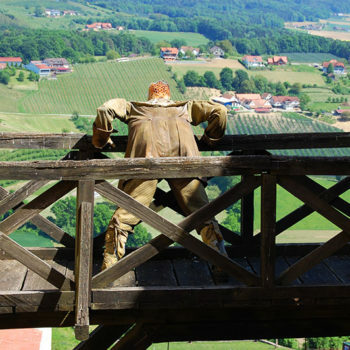 You can walk through Riegersburg Castle on your own or join a guided tour. When exploring the castle from inside, don’t forget to look up! 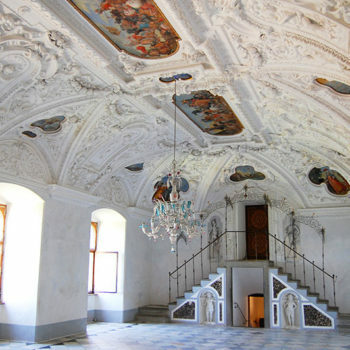 There are some amazing ceiling paintings in some of the castle halls. For example, room 9 has some stunning art work painted by an unknown Italian artist in 1589. What a shame he didn’t sign his masterpiece for history. We spent a couple of hours on our own without stress to see the castle from inside. The rooms open to the public are nicely restored. 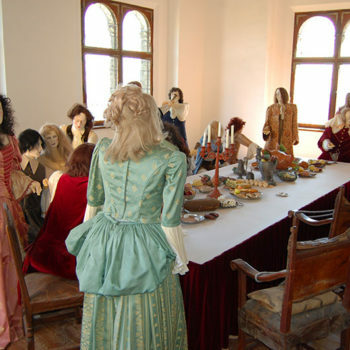 Some empty, others staged to show how life at castle was at certain points during its history. You don’t have to visit the inside of the castle, even though it would be a pity to miss it. 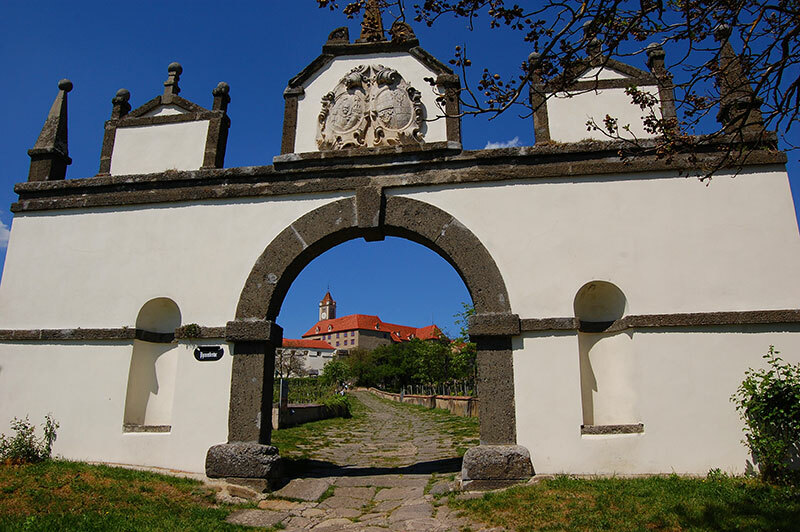 Tickets to the outer and inner castle (including museums) can be bought separately. 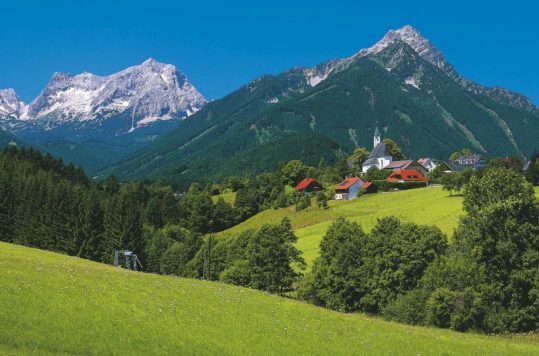 If you only want to enjoy the stunning views of the surrounding landscape or visit the restaurant, this will only set you back a few euros. 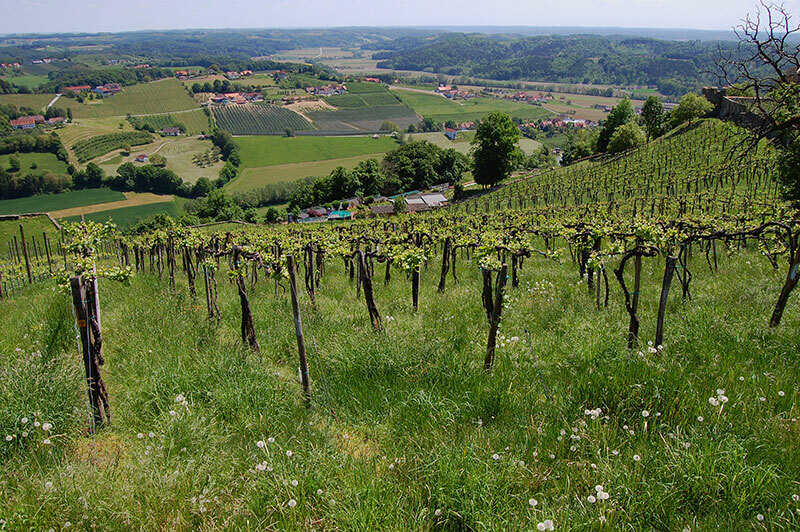 The south-eastern Styria is known for its many vineyards and the also grows grapes on its castle grounds. Sometimes you can find some big birds wandering around the castle grounds. 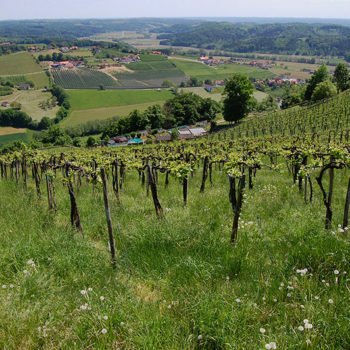 They belong to the Greifvogelwarte Riegersburg which rears birds of prey. We didn’t do the “Birds of prey flying show” which takes place daily and where you can see different birds like owls, falcons and eagles fly. 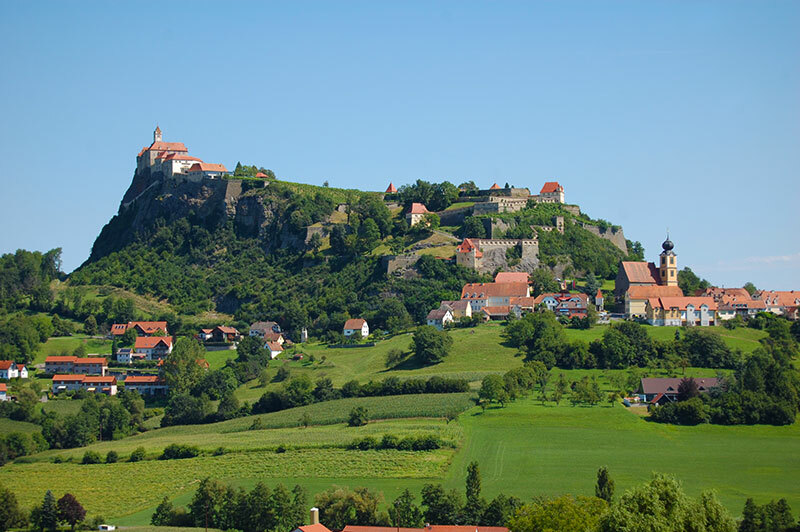 The village below Riegersburg Castle, with the same name as the castle, is also worth a visit. 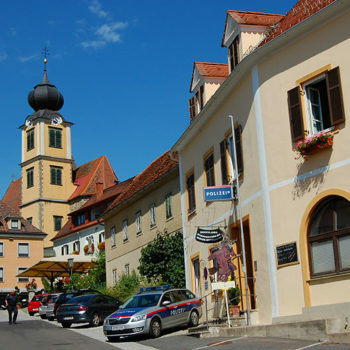 You find a few eateries and accommodation around the small square and in the side streets. On hot summer days, there is waterpark, Seebad Riegersburg, nearby. Its a small but well made artificial lake, surrounded by a nice park where you can spend the day chilling and swimming. 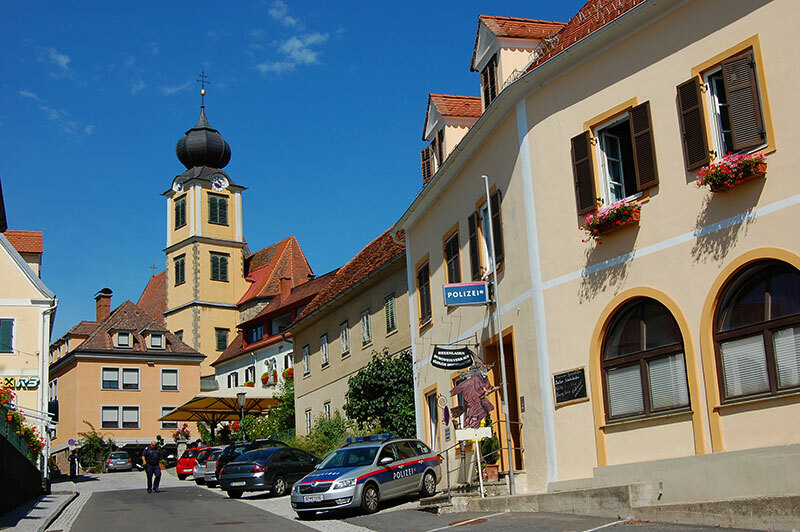 Hence, if you stay nearby Riegersburg has enough activities to keep you busy for a few days, and is perfect for families.